Working from home these days has become quite commonplace. However, for those who are lacking in space, this can often mean sitting at the kitchen table with a laptop. This set up is not particularly conducive to concentration and can make it difficult to get any work done. By creating either a home office in a spare room, or taking over a ‘nook’ in some corner of the house, you’re more likely to focus and be productive. Particularly for those working in a smaller space, bespoke office furniture may be the best choice, as it can be designed to fit precisely into the available space. You can also create furniture that is modular or comes with hidden storage. In terms of the decor, creating a home office can be a little bit tricky. Decorating the space in a cosy, inviting style might appeal to many people; however this kind of look in a room will generally not help with concentration. Although the aesthetics are important, the room itself should be work orientated; that is, the furniture and decorative accessories should be suitable for work only. Items such as sofas, a television or any other furniture which might entice you to take a break once too often, should be avoided. Try to stick with simple, chic and professional decor, such as that which you would find in a ‘real’ office outside of the home. To enhance productivity, the home office needs to be organised and well lit. It should also facilitate the use of equipment such as a computer and printer, with plenty of storage space and it should be comfortable. The main components of any office in the home are filing cabinets, shelving, a desk and an office chair. 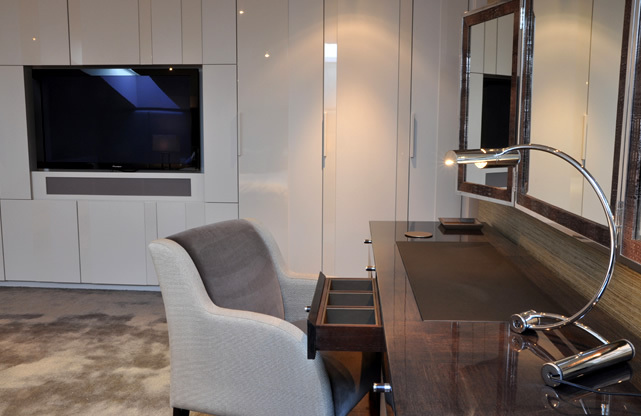 Bespoke office furniture is great for those who need to maximise the space that they have as a bespoke furniture designer can create corner cabinets, clever storage solutions and a desk that fits perfectly into the space you have. Because most people use the small spare room of the house for the office, it’s essential to make it look and feel as spacious as possible. A dark, cramped room is not somewhere that anyone will want to spend time. Make the most of a modestly sized space by painting the walls a bright white or pastel colour. Lighter colours are great for creating the illusion of space. A bright room is also more likely to make a person feel energised and awake; darker, richer colours such as deep red, for instance, tend to be associated with relaxation and cosiness. Along the same lines, try to avoid darker woods when picking out furniture pieces, as these will make a small room look even smaller. Choose light wood grains such as beech and pine. Glass shelving is also a good choice in this respect, as it doesn’t impose on the space as much as dark wooden shelves. Keep the soft furnishings light coloured as well; you can always bring some colour into the room with colourful decorative accessories and desktop items.